A brief description of the consumer promotions offered in the Spring of 2013 along with a deaield overview of the Wells Fargo financing options and how they work. Please note, the programs and promotions described in this video are only valid in the Spring of 2013. While similar programs may exist in the future, please take great care to ensure they are identical to those described in the video before relying on any of the information that follows. 3/31/2019 Sales - Supplies and Accessories SmartLock Installation SmartLock is the innovative fitting solution for your flare, soldering and brazing problems. The process is easy as you'll see through this quick video. 3/30/2019 Service – Condensing Units and Coils TXV vs Fixed Orifice (27 of 31) In this final video explaining the heat pump charging process, it's important to know how the system reacts with a TXV versus a fixed orifice metering device. Greg Sanchez explains all of the key differences. 3/30/2019 Service – Condensing Units and Coils Superheat Charging (26 of 31) When the heat pump is in cooling mode, how do we charge with the superheat method? This next video explains the process. 3/30/2019 Service – Condensing Units and Coils Subcooling Charging (25 of 31) When the heat pump is in cooling mode, how do charge with the sub-cooling method? This next video explains the process. 3/30/2019 Service – Condensing Units and Coils Cycle the System (24 of 31) When charging a heat pump, it's essential that you cycle the outdoor section so you're not chasing phantom frost problems. 3/30/2019 Service – Condensing Units and Coils Basic Charging Discussion (23 of 31) The heat pump is set, wired and ready to be charged. These next few videos, Greg Sanchez explains when and how you want to weigh-in the charge, use superheat or sub-cooling. 3/30/2019 Service – Condensing Units and Coils Heat Pump Low Voltage Wiring (22 of 31) The next step in the installation is wiring a heat pump. There will be extra wires, so Greg walks through what goes where and why. 3/30/2019 Service – Condensing Units and Coils Heat Pump Installation Tips (21 of 31) We now shift to the next segment of a recent training class about heat pumps and talk about some general tips and tricks so the job goes well. 3/29/2019 Service – Condensing Units and Coils Infinity Control Auto Defrost (19 of 31) Infinity controls add another element of functionality not available with traditional thermostats. In this next video, Greg explains how it works. 3/29/2019 Service – Condensing Units and Coils 2-Stage Heat Pump Board & Defrost (18 of 31) In this next video from a recent training class, Greg Sanchez explains the function of the defrost board in two-stage equipment. 3/29/2019 Service – Condensing Units and Coils Quiet Shift (17	of 31) It sounds like a really nice feature, but what is it? Greg explains more and how your homeowners may appreciate you turning it on. 3/29/2019 Service – Condensing Units and Coils Defrost Control Board (16 of 31) So, what does all of this control inside a heat pump? Greg shows the class the different boards that are used in Carrier equipment and some of their features. 3/29/2019 Service – Condensing Units and Coils Heat Pump Defrost Mechanics (15 of 31) So, how does defrost work? Learn more about time and temperature elements that Carrier has programmed into their algorithms. 3/29/2019 Service – Condensing Units and Coils Heat Pump Defrost Overview (14 of 31) Frost on the outdoor coil on a heat pump is a normal process. In this next video from a recent training class about heat pumps, Greg Sanchez explains what you need to know about how the unit defrosts. 2/28/2019 Service – Condensing Units and Coils Packaged Unit Refrigeration Cycle (13 of 31) In this next video from that same heat pump class, Greg explains how the refrigeration cycle looks in a packaged unit. The key difference are check valves that help direct the flow of refrigerant. 2/28/2019 Service – Condensing Units and Coils Duct Free Refrigeration Cycle (12 of 31) Let's get back to the heat pump class that Greg Sanchez recently taught. We earlier discussed how the refrigeration cycle is flipped in a heat pump. In this next video from that class, he explains how the refrigeration cycle works for a ductless mini-split system. 2/28/2019 Service – Furnaces Fan Toggle - Troubleshooting Oops In this final video from a short series on the fan toggle switch, Greg explains how the feature could actually turn into a troubleshooting headache. The key is to know the products you're selling and how they work. 2/28/2019 Service – Furnaces Fan Toggle - Demo So, how does it work? In this second video from a short series on the fan toggle switch, Greg Sanchez shows you how it works and the timing required to make it work. 2/28/2019 Service – Furnaces Fan Toggle - Introduction Most Carrier furnaces have the option of changing continuous fan speeds with a standard thermostat. This feature is often overlooked by many installers and comfort consultants, but it's important that you know how it works and why it is useful. 2/27/2019 Service – Furnaces New Code Compliant Gas Flex Phyllis Lavoy is eager to introduce our new gas flex product. In this video, she explains why we're making the change, how the product is different and who everything would fit together on your job. 1/31/2019 Service – Furnaces 90% Furnace Enhancements (38 of 38) Before concluding this training class, Greg Sanchez shows off a few of the factory's improvements to the 90% furnace family. 1/30/2019 Service – Furnaces Furnace Installation - Final Checks (37 of 38) Let's make the final checks and then we're ready to clean up the job and go home! Greg Sanchez provides some practical final thoughts so you can leave the job proud of your work. 1/30/2019 Service – Furnaces Furnace Installation - Fan Speed Adjustments (36 of 38) All Carrier furnaces have multiple speed options that can be used for cooling and heating. In this next video, Greg Sanchez explains how to read the tables and configure your furnace. 1/30/2019 Service – Furnaces Furnace Installation - Temperature Rise (35 of 38) Another critical step before cleaning up the job is checking temperature rise. Greg Sanchez explains how Carrier furnaces should be adjusted to ensure proper installation. 1/30/2019 Service – Furnaces Furnace Installation - Gas Valve Adjustments (34 of 38) In this follow-up video, Greg Sanchez explains what kind of tools are required to make gas valve adjustments to ensure that you're burning properly. 1/30/2019 Service – Furnaces Furnace Installation - Manifold Pressure (33 of 38) Okay, we're ready to clean up and go home, right? Stop! Greg explains why checking manifold pressure is a critical next step and what can happen if it's not done properly. 1/30/2019 Service – Furnaces Furnace Installation - Control Options (32 of 38) What happens if you connect a single-stage thermostat to a two-stage furnace? In this next video, Greg Sanchez explains the answer and what to do if you want the system to operate differently. 1/30/2019 Service – Furnaces Furnace Installation - Control Hook Ups (31 of 38) The next section of the recent training class on furnace installation is controls. Greg Sanchez starts the segment by explaining common control connections for various configurations. 1/30/2019 Service – Furnaces Furnace Installation - Dip Switches (30 of 38) Some of the circuit boards mentioned in the earlier video have dip switches. They can be confusing, so Greg explains how to read the literature to ensure you're moving them in the right direction. 1/30/2019 Service – Furnaces Furnace Installation - Circuit Boards (29 of 38) Carrier has three tiers of furnace product and several different circuit boards. Knowing the basics of what goes where is the direction Greg ventures in this next video. 1/30/2019 Service – Furnaces Furnace Installation - How to Read Schematics (28 of 38) In this next video in the series, Greg Sanchez explains how to read control schematics. Using a schematic is a critical troubleshooting skill. 1/30/2019 Service – Furnaces Furnace Installation - Ladder Schematics (27 of 38) Learning how to read a ladder schematic is an important skill to learn. Greg Sanchez provides a brief tutorial on how to read them and how they're used in Carrier's literature. 1/30/2019 Service – Furnaces Furnace Installation - Types of Wiring Diagrams (26 of 38) Carrier has lots of different wiring diagrams and in this next video Greg explains the differences and a quick tutorial on how to read them properly. 1/30/2019 Service – Furnaces Furnace Installation - Wiring Diagram Basics (25 of 38) We next move to the electrical side of the furnace installation process in this next video. Let's start with wiring diagrams and how to understand the basic symbols. 1/30/2019 Service – Furnaces Furnace Installation - 90% Condensate Drain (24 of 38) Getting the PVC condensate drain is tricky. In this next video, Greg next explains how easy it is to do it wrong and how it should be done properly to ensure proper flow of condensate. 1/30/2019 Service – Furnaces Furnace Installation - 90% Tubes & Traps (23 of 38) In this next video, Greg Sanchez explains that Carrier's 90% furnaces are shipped in an upflow orientation. What do you do when your jobsite calls for something different? This video explains how and why. 1/30/2019 Service – Furnaces Furnace Installation - Venting 90% Down (22 of 38) Can you vent a 90% furnace downward? That question seems to confuse some people, so Greg explains what you need and how to do it correctly. 1/30/2019 Service – Furnaces Furnace Installation - 90% Vent Sizing (21 of 38) In this next video, Greg Sanchez then explains how to size vent piping for the 90% furnaces and the best fittings to use. 1/30/2019 Service – Furnaces Furnace Installation - 90% Vent & Combustion Air (20 of 38) We also learned that the 90% furnaces are multi-poise in all orientation. Greg again gives some helpful hints on how to get the pipes out of the cabinet correctly. 1/30/2019 Service – Furnaces Furnace Installation - 80% Vent Elbow (19 of 38) We earlier learned that Carrier's 80% furnaces are multi-poise in all orientations. Greg Sanchez follows-up in this next video with some helpful hints and instructions on the right configuration. 1/30/2019 Service – Furnaces Furnace Installation - LP Conversion (18 of 38) Converting a Carrier furnace to propane can be confusing. In this video, Greg explains how to use the KGANP LP conversion kits from Carrier. 1/30/2019 Service – Furnaces Furnace Installation - Gas Piping (17 of 38) In this next video from the training class, we shift our focus to gas piping. Specifically, what's required by code and by Carrier. Plus some best practices on how to do it right! 1/30/2019 Service – Furnaces Furnace Installation - Secondary Drain Pan (16 of 38) Furnaces make water too, so installing a secondary drain pan is an essential part of the installation process. 1/30/2019 Service – Furnaces Furnace Installation - Pitch Requirements (15 of 38) Should the furnace be level or pitched slightly? In this next video, Greg Sanchez explains what works best on the condensing gas furnaces. 1/30/2019 Service – Furnaces Furnace Installation - Working Platform (14 of 38) In this next video, Greg explains roll-out protection and work area requirements and how they differ between 80% and 90% furnaces. 1/30/2019 Service – Furnaces Furnace Installation - Air for Combustion (13 of 38) Every furnace needs adequate combustion air to burn properly. Make sure you have enough air for the total BTU capacity in the closet. 1/30/2019 Service – Furnaces Furnace Installation - Return Air Configurations (12 of 38) Greg next explains how some return air configurations are not allowed. Before designing your return duct system, it would be wise to know where you can connect the plenums. 1/30/2019 Service – Furnaces Furnace Installation - Flanges (11 of 38) Do something with the flanges before hooking up the coil or plenum. In this next video, Greg explains how they should be folded. 1/30/2019 Service – Furnaces Furnace Installation - Prohibited Installations (10 of 38) There are some installation orientations which are expressly prohibited by Carrier. In this next video, Greg explains some of those applications and why they don't work. 1/30/2019 Service – Furnaces Furnace Installation - Return Air Temperature (9 of 38) But I want to use 100% outside air? Greg explains Carrier's defined minimum and maximum return air temperatures and what happens if the guidelines aren't followed. 1/30/2019 Service – Furnaces Furnace Installation - Orientation & Clearances (8 of 38) In this next video from the series, Greg explains the details of how the furnaces can be installed and the clearance to combustibles. 1/30/2019 Service – Furnaces Furnace Installation - Introduction (7 of 38) Now we get to the fun stuff in this next video...how do we install these Carrier furnaces? Yes, it's best to start with the installation instructions (or at least the pictures). 1/29/2019 Service – Furnaces Furnace Lineup (6 of 38) In this next video, Greg provides a brief overview of the different Carrier furnaces available and their basic differences. 1/29/2019 Service – Furnaces Vent System Overview (5 of 38) Furnaces are either Category I or Category IV devices. Greg now explains them so you know what you have and how the vent system is intended to function. 1/29/2019 Service – Furnaces Controlled Combustion Basics (4 of 38) In this next video from a recent training class, Greg Sanchez discusses the physics and chemistry of combustion. 1/29/2019 Service – Furnaces Your Tool Pouch - Multimeters & Manometers (3 of 38) Greg continues his conversation about the right tools, specifically discussing analog vs digital, water versus digital and a variety of other tools that should be in your bag. 1/29/2019 Service – Furnaces Your Tool Pouch - Voltage Detectors & Fuses (2 of 38) Before getting into an installation, it's a good idea to discuss which tools you need for the upcoming job. 1/29/2019 Service – Furnaces Why is Training Important? (1 of 38) In this first video from a recent furnace installation training class, Greg Sanchez explains some basic principles of why we offer training classes and why watching videos like this one is a good use of your time. 12/30/2108 Service - Furnaces ECM Motor Simulator One of the most useful tools in your bag will be the Carrier ECM Motor Simulator. This video from a recent training class is a great introduction to the tool and how you can use it to save time on your upcoming service calls. 12/29/2018 Service – Condensing Units and Coils Heat Pump Service Valve (11 of 31) What is that third service port on a heat pump? In this next video from a recent training class, Greg Sanchez explains what it's for and how it can be used. 12/29/2018 Service – Condensing Units and Coils Heat Pump Components (10 of 31) In the previous videos, we covered many components in a heat pump. There are a few more, so let's crack open the top and Greg will explain what we see. 12/29/2018 Service – Condensing Units and Coils Metering Devices - BiFlow TXV (9 of 31) This next video in the series explains the metering device used today on many residential products. They can be difficult to spot, so Greg explains what to look for and how they work. 12/29/2018 Service – Condensing Units and Coils Metering Devices - TXV & Check Valve (8 of 31) Greg then details a much more common metering device, especially on commercial product, a TXV and check valve combination. 12/29/2018 Service – Condensing Units and Coils Metering Devices - Acutrol (7 of 31) Continuing with our trip down memory lane, Carrier once used an Acutrol metering device. In this video, Greg explains how to find it, how they work, and how to replace one. 12/29/2018 Service – Condensing Units and Coils Metering Devices - Dual Piston (6 of 31) A less common metering device is a dual piston that was used inside older packaged heat pump equipment. 12/29/2018 Service – Condensing Units and Coils Metering Devices - Piston (5 of 31) In a recent training class, Greg Sanchez spends some time explaining five common types of metering devices used with heat pumps. This video focuses on pistons. 12/29/2018 Service – Condensing Units and Coils Accumulators (4 of 31) "A tank that holds refrigerant" may be a simple explanation, but this video explains a whole lot more about accumulators and how they work. 12/29/2018 Service – Condensing Units and Coils Reversing Valves (3 of 31) In this next video from a recent heat pump training class, Greg Sanchez explains everything you ever wanted to know about reversing valves. 12/20/2018 General Thank you All of us at Sigler Wholesale Distributors have a special video message for our customers. 11/30/2018 Sales - Supplies and Accessories iWave-R Air Purifier The Nu-Calgon iWave-R is a revolutionary new product designed to give your homeowners cleaner air. This video from the manufacturer explains how it works and why you should offer it during all of your sales calls. 11/29/2018 Service – Condensing Units and Coils Flipping the Refrigeration Cycle (2 of 31) In this next video from the class, Greg explains how the refrigeration cycle is flipped in a heat pump and what the refrigerant is doing throughout the process. 11/28/2018 Service – Condensing Units and Coils Heat Transfer Basics (1 of 31) In a new class taught in May of 2017, Greg Sanchez explains how heat pumps work. This first video from that class explains the very basics of heat transfer -- moving heat from where it is objectionable to where it is unobjectionable. 10/31/2018 Service - Ductless and VRF Ductless Troubleshooting Overview (35 of 35) In his final video of the series, Josh Vasquez details the troubleshooting process. He also goes in depth on the common E1 and P0, P6, P4, F0 and EE error codes. 10/31/2018 Service - Ductless and VRF Ductless Multi-Zone System Enquiry (34 of 35) The multi-zone ductless system provides some feedback which makes troubleshooting a lot easier. Yes, you might have to push the button 34 times, but it's worth it in the end! 10/31/2018 Service - Ductless and VRF Ductless System Component Check (33 of 35) It's always best to verify if a component works before ordering a replacement. In this video, you'll learn how to check the IPM, compressor, EEV, reversing valve and outdoor fan motor. 10/31/2018 Service - Ductless and VRF Ductless Service Components (32 of 35) What can be replaced on a ductless system? In this next video of the series, Josh explains the different sensors, board and serviceable components and where they are in the system. 10/31/2018 Service - Ductless and VRF Ductless Error Codes (31 of 35) Uh oh ... but I'm getting an error code! Josh explains how to retrieve the LED indicator codes and numeric error codes that may appear on both the indoor and outdoor units. 10/31/2018 Service - Ductless and VRF Ductless Startup (30 of 35) In this next video from a recent training class by Josh Vasquez, he explains the final steps required when starting up a ductless system. 9/30/2018 Service - Rooftop Units MicroMetl Economizer Installation Created by MicroMetl Corporation, this video is a helpful tutorial of how to install a MicroMetl economizer with Jade control on a commercial chassis rooftop unit. 9/29/2018 Service - Ductless and VRF What's Wrong with this Ductless Installation? (29 of 35) Yikes! Somebody didn't watch SiglerTV before installing these ductless systems. Josh Vasquez spends a few minutes showing some funny examples of what can go wrong when a ductless system is installed wrong. 9/28/2018 Service - Ductless and VRF Ductless Installation Wiring (28 of 35) Finally, let's get this system wired. Most systems only use 3 wires, but it can be confusing. In this next video, Josh Vasquez helps explain which wire you need and how to ensure that you've wired it correctly. 9/28/2018 Service - Ductless and VRF Ductless Installation Charging (27 of 35) The next step installing a Carrier ductless split system is charging the system. Here's a hint -- don't try to use the subcooling method. Check out this video from a recent training class to learn the right techniques. 9/28/2018 Service - Ductless and VRF Ductless Installation Leak Test (26 of 35) The Carrier installation instructions offer two different options for verifying that the line sets don't have any leaks. Take your time and do it right! 9/28/2018 Service - Ductless and VRF Ductless Installation Piping (25 of 35) Don't let a bad set of flares mess up your ductless job. Josh Vasquez explains the importance of keeping pipes cleaned and how to flare them properly. 9/28/2018 Service - Ductless and VRF Ductless Installation Outdoor Units (24 of 35) Now that the indoor units are installed, what do we need to know about the outdoor unit? In this video, Josh Vasquez explains the required clearances required line set lengths and required tools. Just as important, he explains what you don't want to install in the refrigerant lines! 9/28/2018 Service - Ductless and VRF Ductless Installation Cassettes (23 of 35) Carrier's 4-way ceiling cassette units have their own set of requirements and tools as well. In this video, Josh Vasquez tells you what you need to know to install the system correctly. 9/28/2018 Service - Ductless and VRF Ductless Installation High-Wall (22 of 35) In this next video, Josh Vasquez explains some of the specific installation requirements and required tools when installing any of the Carrier high-wall ductless fan coils. 9/28/2018 Service - Ductless and VRF Ductless Installation Ducted (21 of 35) Ducted units have some specific installation requirements and required tools which are reviewed in this video. This includes how to set the static pressure settings! 9/28/2018 Service - Ductless and VRF Ductless Installation General Considerations (20 of 35) Continuing with the next video from a recent training class taught by Josh Valasquez, the class learns some of the basics before installing any of the Carrier ductless systems. 8/31/2018 Service - Ductless and VRF Ductless Pressure Protection (19 of 35)	 In this next video from a recent training class, Josh Vasquez explains the different protections that are integrated into Carrier's ductless split systems. 8/31/2018 Service - Ductless and VRF Ductless Built-In Condensate Lift (18 of 35) Josh Vasquez also explains the condensate lift mechanisms found in Carrier ducted and cassette fan coils. 8/31/2018 Service - Ductless and VRF Ductless Crankcase and Basepan Heaters (17 of 35) This video is short and sweet -- Carrier ductless split system have these components to ensure that the system works when it's cold outside. 8/31/2018 Service - Ductless and VRF Ductless Adjustable Temperature Compensation (16 of 35) Warm air rises and that can sometimes cause a high-wall unit to read higher temperatures than what is actually in the room. Carrier ductless split systems adjust for that and this next video in the series explains how it works. 8/31/2018 Service - Ductless and VRF Ductless Forced Defrost and Cold Blow Prevention (15 of 35) In this next video, Josh Vasquez explains how you can demonstrate defrost to the homeowner so they know what to expect, and how to prevent cold-blow during start-up on a Carrier ductless split system. 8/31/2018 Service - Ductless and VRF Ductless Single Zone Refrigerant Leak Detection (14 of 35) What's is Error Code "EC?" A refrigerant leak probably isn't your first guess, but Josh Vasquez explains the error code in this video from a recent training class. 8/31/2018 Service - Ductless and VRF Ductless Multi-Zone System Changeover (13 of 35) Can a multi-zone ductless system heat and cool simultaneously? No? so, what happens if the remotes are in auto-changeover? It could be a problem and this video will help you avoid a call-back! 8/31/2018 Service - Ductless and VRF Ductless Emergency Operation, Freeze Protection and Auto restart (12 of 35) What happens if the wireless remote is lost? What if I want to set my cabin temperature to 46? What happens when the power goes out? All of these questions are answered by Josh Vasquez in this next video from a recent training class. 8/31/2018 Service - Ductless and VRF Ductless Follow Me Features (11 of 35) One of the most important and often misunderstood features of the Carrier ductless split system is "Follow Me." In this next video, Josh Vasquez goes into great detail about how it works so you understand what it does and what it doesn't do. 8/31/2018 Service - Ductless and VRF Ductless Sleep, Silent, Dry and Turbo Modes (10 of 35) There are four other options that might not be intuitive, so Josh Vasquez explains how they all work and what your homeowners should expect. 8/31/2018 Service - Ductless and VRF Ductless Self Clean Mode (9 of 35) A little different than your oven, "Self Clean" is an option on Carrier ductless sytems. Josh Vasquez explains how it works even though it is more relevant in high humidity markets. 8/31/2018 Service - Ductless and VRF Ductless Sensors and Communication (8 of 35) In this next video from a recent training class, Josh Vasquez explains how the two components of a ductless split system communicate and the various sensors that are used. 7/30/2018 Service - Ductless and VRF Ductless Controls (7 of 35) Carrier ductless split systems have a lot of control features and options that Josh explains in this next segment. He also dives into the wall mounted, WiFi and handheld control options for the systems. 7/30/2018 Service - Ductless and VRF 40MHH Overview and Product Improvements (6 of 35) While positioned as a Comfort Series product, the Carrier 40MHH high-wall fan coil is full of features and benefits that make it easier to install and service. 7/30/2018 Service - Ductless and VRF Ductless Product Overview (5 of 35) What products are available from Carrier? Josh Vasquez explains all of them in this high-level overview of the product family. 7/30/2018 Service - Ductless and VRF Ductless Defrost Mode & Low Ambient Capacity (4 of 35) Josh continues the introductory product overview by explaining how the defrost mode works and some of the incredibly low limits of low ambient cooling. 7/30/2018 Service - Ductless and VRF Ductless Operating Principles (3 of 35) In his next video of this series, Josh Vasquez explains the basics of how Carrier's ductless units work in cooling mode and heating mode. 7/30/2018 Service - Ductless and VRF Ductless Inverter Technology (2 of 35) Beyond the obvious lack of ductwork, there is some unique technology in Carrier's line of ductless fan coils. One key difference is the inverter technology. Josh explains the details of how an inverter works and what it does when the system is operating. 7/30/2018 Service - Ductless and VRF What is a Ductless System? (1 of 35) In this first video of a new series of classes, Josh Vasquez explains the very basics of what a ductless system is, where it can be used and some of the many features and benefits. 6/31/2018 Sales – Equipment 24VNA0 In-Home Selling Selling top-tier equipment can be challenging at the kitchen table. In this final video of the series, Jon Malkovich goes back to the basics and offers viewers a reminder on how to sell. 6/30/2018 Sales – Equipment 24VNA0 Compatibility & Warranty Jon Malkovich continues the conversation on the new 24VNA0 by discussing system compatibility, warranty, dimensions, transition and inventory planning. 6/30/2018 Sales – Equipment 24VNA0 Durability While the 24VNA0 is in the traditional Infinity cabinet that has been available for a few years, it's worthwhile to review the many benefits it affords a homeowner and servicing contractor. 6/30/2018 Sales – Equipment 24VNA0 Humidity Control Humidity isn't normally an issue in the Bay Area, but it can be. In this next video of the series, Jon Malkovich explains how the 24VNA0 can control humidity even when the temperature is below setpoint. 6/30/2018 Sales – Equipment 24VNA0 Performance How a two-stage air conditioner works, let alone a variable speed air conditioner, can be confusing. This video explains how the new 24VNA0 is going to perform under different circumstances and much electricity it consumes at various operating conditions. 6/30/2018 Sales – Equipment 24VNA0 Technology In this next video of the series, Jon Malkovich explains the technology within the 24VNA0 and how it works (both from a contractor's perspective and a homeowner's perspective). 6/30/2018 Sales – Equipment 24VNA0 Efficiency The other new unit launched in 2018 was the Carrier 24VNA0. In this video from a series of 9 recorded during a recent training class, Jon Malkovich discuses the efficiency. 6/29/2018 Sales – Equipment 24APB6 Introduction One of the two new units launched in 2018 was the Carrier 24APB6. This video reviews the efficiency, technology and performance. 6/29/2018 Sales – Equipment Carrier AC Lineup In the first of a series of 9 videos, Jon Malkovich explains how Carrier's 2018 cooling lineup as it has changed to accommodate two new air conditioners. 5/31/2018 Service – Controls and Accessories Infinity User Interface Service Tool In this final video from the Infinity training class, Greg explains how to use an extra user interface as a service tool. 5/31/2018 Service – Controls and Accessories Infinity with Home Automation Have a homeowner who has a sophisticated home automation system? Carrier now has an open API which allows developers to create an interface to the Infinity control in addition to the hard-wired RS-232 interface. Greg explains more in this video from a recent training class. 5/31/2018 Service – Controls and Accessories Infinity Homeowner Education Videos Are you struggling to educate a homeowner on the "Smart" functions of the Carrier Infinity system? This video explains how you can get to some additional videos from the factory on how it all works. 5/31/2018 Service – Controls and Accessories Alexa and Apple Home Kit Alexa, set the temperature upstairs to 72 degrees. Does that work with Carrier's Infinity system? Find out here! 5/31/2018 Service – Controls and Accessories Infinity Zoning Design - System Checks In this final video from a recent class where Greg talks about Infinity zoning, he explains a likely scenario that you may experience when start-up that new system and how the system does what it's supposed to do. 5/31/2018 Service – Controls and Accessories Infinity Zoning Design - Furnace Selection When designing an Infinity Zone System, how do we use the airflow limits to select the right furnace for the job? Greg Sanchez explains how in this must-see video. 5/31/2018 Service – Controls and Accessories Infinity Duct Assessment & Airflow Limits In a recent training class, Greg Sanchez explains why the Infinity zone system performs a duct assessment and casts some light on the critically important airflow limits for each zone. 5/31/2018 Service – Controls and Accessories Carrier Dampers Whether you're using the Comfort Series zone boards, Performance Zone Kit or Infinity Zoning, you may be tempted to put a volt meter on a Carrier damper. Hmmmm, you may want to watch this video first. 4/30/2018 Sales - Equipment Using a Duct Calculator In the final video of this series on airlfow, Jon Malkovich discusses how to use the calculator and some suggested sizing principals for both supply and return ducts. 4/30/2018 Sales - Equipment Understanding Static Pressure In this second video, Jon Malkovich uses some simple illustrations to explain static pressure and the effect on different types of furnaces. 4/30/2018 Sales - Equipment Airlfow Basics In the first of a three-video series on airflow, Jon Malkovich discusses some basic principals like volume, velocity, friction and airflow rate. 3/31/2018 Service – Controls and Accessories Infinity Dealer Information How do you get your information into your homeowner's Infinity Touch Control? There are a couple of different ways, and Greg Sanchez explains how in this recent video. Regardless of how it's done, it's important, so make sure your homeowners are selecting you (and not your competition). 3/31/2018 Service – Controls and Accessories Infinity Software Updates In this video, Greg Sanchez explains software updates, how they occur, why they occur and what you need to do if your homeowner's Infinity Touch Control isn't updating on its own. 3/30/2018 Service – Controls and Accessories Infinity Feature - Daily Duct Assessment In this sixth and final video from a recent training class, Greg Sanchez explains how and why Carrier's Infinity system runs the fan every day for a few minutes. Also, why it's not a great idea to switch the system into "Off" mode. 3/30/2018 Service – Controls and Accessories Infinity Feature - Smart Setback Do you struggle to figure out what temperature to use for "Away" mode on your thermostat? If you struggle, how are you going to explain it to a homeowner? The Infinity Touch Control can figure it out for you and Greg Sanchez explains how it works in this video. 3/30/2018 Service – Controls and Accessories Infinity Feature - Smart Recovery In this fourth video of the series, Greg Sanchez explains to a recent training class one of the most hated and most loved feature of the Infinity Touch Control. You need to know what it means and need to talk with every homeowner before finishing the installation. 3/30/2018 Service – Controls and Accessories Infinity Feature - Simultaneous Heat and Cool Mode Huh? Simultaneous Heat and Cool? In version 14 of the Infinity Control handles this common issue differently than previous versions of the control. 3/30/2018 Service – Controls and Accessories Infinity Feature - Auto Changeover In this next video, Greg explains how auto changeover with the Infinity Control is a little different from other stats on the market. 3/30/2018 Service – Controls and Accessories Infinity Feature - Overcool to Dehumidify In this first video in a series of six special Infinity Control features, Greg Sanchez explains what it means to overcool to dehumidify. Sometimes in this area, humidity and temperature need to be controlled for a comfortable home. before? Did you have a good answer? Check out this video to learn how Carrier displays temperature on the Infinity Control. explains how to set it up and how you may want to use it on your next project. 2/27/2018 Service – Controls and Accessories Oops, Locked Smart Sensor In this final video, Greg explains how a smart sensor gets locked, and more importantly, how to get it unlocked. how to use demo mode. this one, he explains what to do if the Infinity Control can't find an outdoor unit. 1/31/2018 Service - Furnaces 90% Furnace Improvements Carrier has recently made several improvements to their 90% furnace product family. As a results, their 90% furnaces are 100% easier to install! 1/30/2018 Service – Controls and Accessories Infinity Setup - Accessory In this final video in the series, Greg Sanchez explains how to set up indoor air quality accessories with the Infinity Touch control. 1/30/2018 Service – Controls and Accessories Infinity Setup - Zoning	 Zoning setup can be confusing, but in this next video in the series, Greg Sanchez explains some of the basic setup procedures for the Infinity Touch Control. 1/30/2018 Service – Controls and Accessories Infinity Setup - Outdoor Unit Next up is, setup for the communicating outdoor unit. Not a lot of options, but you can setup cooling lockouts and latch. 1/30/2018 Service – Controls and Accessories Infinity Setup - Furnace In his next video from a recent training class, Greg explains furnace setup options. This includes airflow limits, staging and dhum drain. 1/30/2018 Service – Controls and Accessories Infinity Setup - Thermostat In this series of five videos, Greg Sanchez explains several of the common setup options with the Infinity Touch Control. In this video, he focuses on thermostat options, including the often-confusing Smart Recovery feature. 12/28/2017 Service – Controls and Accessories Infinity Start-Up Sequence What happens when you power up an Infinity control for the first time? Greg walks through the entire process and what's going on behind the scenes. 12/27/2017 Service – Controls and Accessories Infinity Set-Up Menus In a recent training class, Greg Sanchez explains the basic menu and installation/setup menu structure of the Infinity Touch Control. 11/30/2017 Service – Condensing Units and Coils Heat Pump Basics Sigler Wholesale Distributors recently hosted an entire class about heat pumps (look for the videos in mid-2018). However, here is a quick overview about the basics of a heat pump system. 11/29/2017 Service - Furnaces Can I vent a 90% furnace down? It is possible (and potentially very handy) to vent the flue pipes down into the crawl space.. Just make sure you use the kit and check out this video first. 11/29/2017 Service - Furnaces Blown control fuse, now what? It happens to all service techs and the tendency is to panic. In a recent training class, Greg Sanchez explains a systematic approach that you should take toward diagnosing the cause of a short in a Carrier furnace. 10/31/2017 Service - Furnaces DIP Switches - Items to Ask Yourself Okay, but why are the DIP switch settings important? Here are some things to consider before making the adjustments for your specific application. 10/31/2017 Service - Furnaces DIP Switches - Overview DIP switches can be confusing and are becoming increasingly critical when configuring Carrier furnaces. in this video, Greg explains how to read Carrier's diagrams and charts so you can get it right the first time. 10/30/2017 Service - Furnaces Resolving Pressure Switch Issues In this final video of the series, learn how to diagnose pressure switch faults and where to look first. 10/30/2017 Service - Furnaces Pressure Switch Labels In Greg's second video, he explains how to read the labels on the pressure switches sold at Sigler Wholesale Distributors. 10/30/2017 Service - Furnaces How do I Check a Pressure Switch? The first in a series of three videos about furnace pressure switches, Greg Sanchez explains how you can check one to make sure it's operating properly. 9/30/2017 Service - Furnaces Manifold pressure - Tools In this fourth and final video in this segment, Greg Sanchez explains what tools you need to measure and adjust manifold pressure. 9/30/2017 Service - Furnaces Manifold pressure - 26,000 Btuh 90% Furnaces Last year, Carrier launched a low-capacity 26,000 Btuh furnace. Setting the manifold pressure does on this model does require some extra attention which Greg Sanchez explains in this clip from a recent training class. 9/30/2017 Service - Furnaces Manifold pressure - Modulating Furnaces Okay Greg, what about the 59MN7 modulating furnace? In the second clip in this series, he explains how to set the manifold pressure for this furnace. 9/30/2017 Service - Furnaces Manifold Pressure - 90% Single Stage Furnace What is the proper manifold pressure for a single stage 90% furnace, 40,000 Btuh and above, operating on natural gas in the greater San Francisco Bay Area? Why does it matter? In a recent training class, Greg Sanchez explains it all. 9/29/2017 Service - Furnaces Approved RTV Compounds and Where to Use When servicing a furnace, it's important to know when you can use RTV sealant, what kind should be used and where you can use it. Hint, neither of the two approved options are red! 9/27/2017 Service - Furnaces Tail Chasing with Fault Codes Is it 42 or 24? Short blinks first or second? Ugh...help! Greg Sanchez does in this clip from a recent training class. 8/31/2017 Service - Furnaces Troubleshooing Indoor Fan Motors - Real World Issues In the fourth and final video of this series from a recent training class, Greg Sanchez explains some odd situations you may encounter when troubleshooting the ECMx or PWM motors. 8/31/2017 Service - Furnaces Troubleshooing Indoor Fan Motors - Ohm Out the Motor Is it possible to ohm out an X-13 or PWM motor? In video three, Greg answers "Yes." It's easy to do and can quickly rule out a motor failure so you only need to buy a replacement module. 8/31/2017 Service - Furnaces Troubleshooing Indoor Fan Motors - PWM In video two, Greg Sanchez explains how to troubleshoot the PWM motor, which is really a communicating version of the ECMx. 8/31/2017 Service - Furnaces Troubleshooing Indoor Fan Motors - ECMx In this series of four videos, Greg Sanchez explains how to easily troubleshoot the ECMx or X-13 indoor blower motor. 7/31/2017 Service – Controls and Accessories Infinity Wiring - Zone Sensors In this final video about infinity wiring, Greg explains a common hurdle that often pops up when wiring smart sensors to the Infinity System zone damper control model. 7/31/2017 Service – Controls and Accessories Infinity Wiring - Damper Control Module What components are required for zoning? In a recent training class, Greg Sanchez explains the damper control module, dampers, smart sensors and remote room sensors. 7/31/2017 Service – Controls and Accessories Infinity Wiring - Non-Communicating Outdoor Can I use a non-communicating air conditioner with Infinity Controls? Yes! In this recent training class, Greg Sanchez explains how. 7/31/2017 Service – Controls and Accessories Infinity Wiring - 24VNA9 Yes, the wiring is simple but you may scratch your head when installing the five-stage communicating air conditioner. Review this video first to eliminate any of the confusion. 7/31/2017 Service – Controls and Accessories Infinity Wiring Basics ABCD seems pretty simple, and it is. However, this video explains what each of the wires are used for with Infinity Communicating Controls. 7/30/2017 Service – Controls and Accessories Infinity Controls & Equipment What are the different Infinity Control products available and what works with what? In this video from a recent training class, Greg Sanchez explains all of it. 6/30/2017 Service - Furnaces PWM Cooling Airflow Cooling and constant fan airflow have several adjustment options. Check out this video before heading to the jobsite. 6/29/2017 Service - Furnaces PWM Motors We probably should no longer call PWM motors "new" but there is still some confusion with these motors installed in the 58CTY and 59TP6 furnaces. In a recent training class, Greg Sanchez helps alleviate the confusion. 5/30/2017 Service - Furnaces Things that Ought to Get Our Attention - IX Yikes, this one is sure to get your attention, but what do we do next? There are a couple of problems with this picture that need to be fixed. 5/30/2017 Service - Furnaces Things that Ought to Get Our Attention - VIII The boot isn't sealing to the PVC. May not be something you notice right away, but can cause a lot of havoc in the future. 5/30/2017 Service - Furnaces Things that Ought to Get Our Attention - VII High static pressure might be typical, but it's not right and not good for the homeowner or equipment. Take a step back and figure out what's going on. 5/30/2017 Service - Furnaces Things that Ought to Get Our Attention - VI It's a good idea to take a peak inside the coil box while doing your planned maintenance. Carpeting the evaporator coil will probably result in poor airflow and odd pressures! 5/30/2017 Service - Furnaces Things that Ought to Get Our Attention - V Wow, an orange flue pipe inside the cabinet? Yep, and it's pretty straight forward to figure out what's going on with the furnace and what your next steps should be. 5/30/2017 Service - Furnaces Things that Ought to Get Our Attention - IV A hole in the wall of the vestibule next to the limit switch? Huh? If you don't know what happened before you arrived, there are some clues that can give you a good idea about what's going on with the furnace. 5/30/2017 Service - Furnaces Things that Ought to Get Our Attention - III Lot of potential problems with this one. Yeah, the homeowner may need a new roof, but we also have a problem with the furnace vent piping. 5/30/2017 Service - Furnaces Things that Ought to Get Our Attention - II What about this one? When you're doing your spring maintenance, don't hesitate to take a peak inside the furnace. Keep your eyes open for these potential problems. 5/30/2017 Service - Furnaces Things that Ought to Get Our Attention - I Look at the picture and explain what you see. Why might you be getting this service call on your schedule? What's causing the problems? What do we do next? In this next series of videos, Greg Sanchez guides through the class through these questions. 4/29/2017 Service - Furnaces New Furnace with Old Duct System Greg Sanchez concludes this series from a recent training class explaining what can happen when you put a new furnace on an old duct system. Limit trips? Too much noise? Yep...always make sure you're inspecting the duct system to ensure the static pressure is low and it can deliver the amount of air required for the job. 4/29/2017 Service - Furnaces Effects of Increased Static With increased static, airflow may go down and amp draw may go up. This video explains the effects depending on the motor. Regardless, it's not a good path toward creating high homeowner satisfaction. 4/29/2017 Service - Furnaces What Contributes to High Static Pressure? Okay so if high static pressure is a problem, how do we improve it? How does a technician check it with a dual port manometer? 4/29/2017 Service - Furnaces What is Static Pressure? In the second video, Greg Sanchez defines static pressure and explains how to read the fan performance tables found in all of the Carrier furnace product data documents. 4/28/2017 Service - Furnaces Determining CFM and Static Pressure The first of five videos where Greg Sanchez explains the basics of static pressure, why we care, and how static and CFM can be determined. 4/27/2017 Service – Condensing Units and Coils It Doesn't Cool -- Now What? Different project but another photo. Greg works with the technicians attending this recent training class to help diagnose the issue. Hmmmm, can you figure it out? 4/27/2017 Service – Condensing Units and Coils It Doesn't Cool - What's Up? Greg shows a photo and works with the technicians attending this recent training class to help diagnose the issue. Great practice for what we might see this summer! handy. Don't automatically disregard the information a customer provides you about their cooling issues. 4/27/2017 Service – Condensing Units and Coils It Doesn't Cool -- 2 Stage Units What about 2-stage machines? Greg Sanchez continues to offer suggestions if the homeowner tells you that the unit doesn't cool well when it's hot outside. 4/27/2017 Service – Condensing Units and Coils It Doesn't Cool -- Safety Trips In a recent training class, Greg Sanchez explained several reasons why an air conditioner may not be working. In this first segment, he describes some safety trip issues that prevent cooling. 3/31/2017 Service – Condensing Units and Coils Basic Symptom Analysis - Dirty Condenser Okay, but this time the pressures are up and the sub-cooling is down. Huh? What's going on? With these videos from Greg Sanchez, download the Basic Symptom Analysis quick reference. 3/31/2017 Service – Condensing Units and Coils Basic Symptom Analysis - Low Evaporator Airflow Now both pressures are down and so is superheat. What's going on? WWith these videos from Greg Sanchez, download the Basic Symptom Analysis quick reference. 3/31/2017 Service – Condensing Units and Coils Basic Symptom Analysis - Liquid Restriction Okay, there is some sort of restriction betwen the condensing unit and the evaporator. How might we be able to figure out that problem? With these videos from Greg Sanchez, download the Basic Symptom Analysis quick reference. 3/31/2017 Service – Condensing Units and Coils Basic Symptom Analysis - Undercharge With suction pressure down and superheat up, what's going on? With these videos from Greg Sanchez, download the Basic Symptom Analysis quick reference. 3/31/2017 Service – Condensing Units and Coils Basic Symptom Analysis - Overcharge Assume we have high pressures, high sub-cooling and high amps. What's going on? With these videos from Greg Sanchez, download the Basic Symptom Analysis quick reference. 3/31/2017 Service – Condensing Units and Coils Basic Symptom Analysis - Refrigeration Circuit When troubleshooting a condensing unit, do you ever draw out a refrigeration circuit to identify the problems? Probably a good idea to start! With these videos from Greg Sanchez, download the Basic Symptom Analysis quick reference. 3/30/2017 Service – Condensing Units and Coils 24VNA9 - Incorrect Charging The three most important things to remember when installing a 24VNA9 is charge, charge and charge. This video reviews what happens with incorrect charging and how to avoid it. 3/30/2017 Service – Condensing Units and Coils 24VNA9 - Software Changes In a recent training class, Greg Sanchez explains all the upgrades to the 24VNA9 software, fault codes and service manual. 3/30/2017 Service – Condensing Units and Coils 24VNA9 - Operating Conditions What happens if you try to charge a 24VNA9 air conditioner on a 55-degree day? You'll want to review this video before all of your start-ups. 3/30/2017 Service – Condensing Units and Coils 24VNA9 - Low Voltage Conection In a recent training class, Greg Sanchez reviews how the 24VNA9 is wired with and without Infinity controls. 3/30/2017 Service – Condensing Units and Coils 24VNA9 - Important Reminders It may be a few months since you've sold or installed a 24VNA9 air conditioners. Greg Sanchez outlines some important reminders on this Infinity 5-stage air conditioner. 2/24/2017 Service - Furnaces Furnace Code 25 Uh oh, code 25. A model plug error seems easy enough, but in a recent training class, Greg Sanchez explains all of the details. 2/24/2017 Service - Furnaces Two-Stage Furnace Code 31 n the 58CTX, 58CVX, 58MTB and 58MVB, code 31 can be a confusing one. Is it a pressure switch issue or a control relay issue? Greg Sanchez will help you understand how to best proceed. 2/23/2017 Service - Furnaces Furnace Condensate Traps - Horizontal Install Greg Sanchez explains what adjustments are required to the furnace condensate trap when it's being installed in a horizontal application. 2/23/2017 Service - Furnaces Furnace Condensate Into a Pump In a recent training class, Greg Sanchez explains how to best drain condensate into a pump. 2/23/2017 Service - Furnaces Furnace Condensate Traps All the good, bad and ugly information you need to know about furnace condensate traps. 1/31/2017 General New App If Greg Sanchez has this new app on his phone, you and your technicians should as well. Carrier's new Service Technician has it all and should probably be a requirement for any field personnel. 12/28/2016 Sales - Supplies and Accessories Zoning Basics In a recent training class, Jon Malkovich fielded a question on zoning which turned into a nice overview of the zoning basics. 12/27/2016 Service – Condensing Units and Coils You Play Tech Rep II Want to try again? The superheat is really high, what do you do? 12/27/2016 Service – Condensing Units and Coils You Play Tech Rep I Now it's your turn to play the tech rep. The amp draw is too high, what do you do? 11/30/2016 Service - Furnaces Obsolete Variable Speed Inducer Kit The HC23CE116 inducer motor is no longer available. Find out what we can use in this video, including a tip on a necessary pressure switch change. 11/30/2016 Service - Furnaces MR to MQ Motor Supersession When replacing a MR motor with an MQ motor on the 59SP5 or 59TP5 furnaces, there are some wiring changes that you'll want to know about before showing up to the jobsite. 11/29/2016 Sales - Equipment How does Defrost Work? In a recent training class, Jon Malkovich explained how the defrost cycle on a heat pump works and why it's important to explain it to your homeowners. 11/28/2016 Service - Furnaces 90% Condensate Drain Greg Sanchez explains the best way to install a condensate drain on a Carrier or Payne 90% condensing gas furnace. 10/31/2016 Service - Furnaces Code 31 - Software Enhancements Nuisance code 31 error codes? A recent software enhancement will help. 10/31/2016 Service - Furnaces Code 31 - Inducer Housing Can a single drop of water can cause a pressure switch issue? Find out how, and more importantly how to fix the problem in the field. 10/31/2016 Service - Furnaces Code 31 - LP Conversion Sometimes LP Conversion can cause issues with pressure switch trips. Greg Sanchez explains more in this clip from a recent training class. 10/31/2016 Service - Furnaces Code 31 - Single Stage Pressure Switches In a recent training class, Greg Sanchez explains the details of code 31 and how to diagnose the problem on a single stage furnace. 10/31/2016 Service - Furnaces Code 31 - Pressure Switches Most commonly seen on the single stage 90% furnaces, Greg Sanchez explains more about this sometimes confusing error code. 10/31/2016 Service - Furnaces Code 31 or 13 Don't chase your tail. Is it code 31 or code 13? 10/25/2016 Service - Furnaces PWM Motors - Infinity Control In a recent training class, Greg Sanchez explains when and how you can use Infinity controls with these Performance Series furnaces. 10/25/2016 Service - Furnaces PWM Motors - Low Stage Airflow for 2-STage AC Using a 2-stage outdoor unit with the 58CTY or 59TP6 is possible, but you'll want to check out this video for some guidance. 10/25/2016 Service - Furnaces PWM Motors - Fine Tuning Adjustment While dip switches may seem like a difficult way to program the fan speeds, they do give you the ability to make some fine tuning adjustments to the airflow. 10/25/2016 Service - Furnaces PWM Motors - Setting the Airflow The 58CTY and 59TP6 use a different type of motor and setting the airflow is different than other machines. 10/21/2106 Service - Furnaces Limit Switches - Measuring Temperature Rise The best way to diagnose a limit switch issue is to check manifold pressure and then measure the temperature rise. Find out how right here. 10/21/2016 Service - Furnaces Limit Switches - Factory Standards are Best Who is better at designing a furnace...you or the factory engineers in Indianapolis? Don't mess with the limit switch. 10/21/2106 Service - Furnaces Limit Switches - Importance What are limit switches, why do we have them, and can I use a different one if the factory rated switch keeps failing? Greg Sanchez answers this and more during a recent training class. 10/15/2016 Service - Furnaces Code 33 - Stat Losing Time Ever changed a thermostat becasue it was losing time? It's probably not the thermostats fault, but could actually be a code 33 error. 10/15/20116 Service - Furnaces Code 33 - Draft Safeguard Switch How does a draft safeguard switch work on the 80% furnace and what does it have to do with code 33 errors? 9/30/2016 Service - Furnaces Code 33 - What Have You Done? Okay, so you have a code 33 on a furnace with a limit switch that keeps tripping. Before replacing the switch, let's ask some basic troubleshooting questions first. 9/30/2016 Service - Furnaces Code 33 - Main Limit In a recent training class, Greg Sanchez explains how to troubleshoot a main limit switch. 9/30/2016 Service - Furnaces Code 33 - But It's Still Running You may have seen it in the Wholesale Newsletter. Greg Sanchez explains why your furnace may keep running after a limit switch trip. Or, why it's always running on high. 9/30/2016 Service - Furnaces Code 33 - 58MVC Furnace Error code 33 on a 58MVC can be tricky. Greg Sanchez explains it during a recent training class. 9/30/2016 Service - Furnaces Code 33 - 58M Heat Exchanger Replacement It's not easy, but Greg Sanchez offers a few tips on how to make it a little better for you, including the importance of the rear air baffle. 9/30/2016 Service - Furnaces Code 33 - 59MN7 Manifold Pressure In a recent training class, Greg Sanchez details one "guaranteed" way to get a limit switch to trip and code 33. Simply fail to check the manifold pressure on the 59MN7 furnace. 9/29/2016 Sales - Equipment Using Long Line Sets How long is too long? Jeremy Parrish explains what defines a long line application and what accessories are required to ensure the system works correctly. 8/31/2016 Sales - Equipment Ratings with 3-Phase Equipment In a recent training class, Phyllis LaVoy explains how to get ratings with 3-phase equipment. 8/30/2016 Sales - Equipment When is 21 SEER not 21 SEER But the brochure says "21 SEER!" In this snip from a recent training class, Jeremy Parrish explains why you can't sell your homeowners a system based on the marketing brochure. 8/30/2016 Sales - Equipment How Much Electric Heat Should I order? In a recent training class, Jon Malkovich gave a thorough overview of how much electric heat should be ordered for your residential heat pump jobs. Plus a bonus explanation of why you may not need electric heat with the 25VNA0 heat pump. 7/31/2016 Sales - Supplies and Accessories Air Cleaning and Purifying There are several different options available, so John Coleman presented the differences between the Carrier and Totaline air cleaning and air purifying products during this segment from a recent training class. 7/31/2016 Sales - Equipment Blower Motor Overview Jon Malkovich provides an overview of the four different types of motors found in Carrier's furnaces. 7/28/2016 Sales - Equipment How to use the words "Variable Speed" In a recent training class, we discussed the risks of using the words "Variable speed" when describing the motors found in Carrier's Infinity furnaces. 7/27/2016 Sales - Equipment Minimum Airflow on Infinity Phyllis LaVoy helped explain how to determine the minimum airflow required for various Infinity products during a recent training class. You'll see the huge advantage to the 59MN7A furnaces and 24VNA9 air conditioners. 6/30/2016 Sales - Supplies and Accessories Non-Infinity Zoning Options While nothing beats the Infinity zoning system, Jeremy Parrish compares and contrasts the other non-communicating options that are available. 6/30/2016 Sales - Equipment Using an Existing 1/4" Line Set In a recent training class, Jeremy Parrish explains how an existing 1/4" line set can be still used with some of today's 14 SEER equipment. 5/31/2016 General Honoring Russ Sigler Russ Sigler was recently honored at the Carrier National Factory Authorized Dealer Meeting. This video shows the inspirational, motivational and humorous moments from that meeting. 5/27/2016 Service – Condensing Units and Coils Charging in Extreme Conditions You can't always charge an air conditioner when it's 90 degrees outside. So, what can you do when the conditions inside or outside are not ideal? Greg Sanchez explains in this segment from a recent training class. 5/26/2016 Service – Condensing Units and Coils Noise/Vibration within Structure - Other Options In this clip from a recent training class, Greg Sanchez explains other options for dealing with noise and vibration that is occurring inside the structure. 5/26/2016 Service – Condensing Units and Coils Noise/Vibration within Structure - Piping Design Noise and vibration within the structure can be a problem, and piping design makes a difference. Greg Sanchez explains good (and bad designs) in this clip from a recent training class. 4/30/2016 Service – Controls and Accessories Troubleshooting Infinity Communications It’s not as tricky as you might think. Greg Sanchez explains how you can troubleshoot Infinity communications and isolate the problems with your volt meter. 4/30/2016 Service – Condensing Units and Coils Capacitors How can you figure out which capacitor is best (or will work) with your system? Here are some simple answers that will keep your systems running. 4/29/2016 Service – Condensing Units and Coils Compressors - R22 with POE Oil Yep, R-22 compressors now ship with POE oil? Why? What should I do? Find out in this clip from a recent training class by Greg Sanchez. 4/29/2016 Service – Condensing Units and Coils Compressors - Filter Driers In a recent training class, Greg Sanchez explained how filter driers work and why they’re important. 4/29/2016 Service – Condensing Units and Coils Compressors - Sticking TXV's A couple of summers ago, we had a problem where a rust inhibiter would cause TXV’s to stick. The problem still comes up, so check out this video about what you can do to help solve the problem. 4/29/2016 Service – Condensing Units and Coils Compressors - Using an Ohm Meter “Ohming-out” a compressor should be taught on day 1 of “Service Tech School,” but we won’t tell anyone if you check out this video to refresh your memory. 4/29/2016 Service – Condensing Units and Coils Compressors - Thermal Failures In a recent training class, Greg Sanchez discussed compressor thermal failures, why they happen, and how you might be able to avoid them in the future. 4/28/2016 Service – Condensing Units and Coils Downflow Furnaces with Coils We see it all the time, but there are some very important factors you must consider and address when installing a downflow furnace with an evaporator coil. 4/28/2016 Service – Condensing Units and Coils Changing Two-Stage Compressors In a recent training class, Greg Sanchez advised the class of some potential issues when replacing two-stage compressors. 3/31/2016 Service – Condensing Units and Coils 24VNA9 - Using a Second Infinity Controller A clip from a recent training class where Greg Sanchez shows how you can use a second Infinity Touch controller to make your job easier. 3/31/2016 Service – Condensing Units and Coils 24VNA9 - Status Code 68 Fault code 68 should really be called "Status Code 68." Regardless, Greg Sanchez explains what it mean during a recent training class. 3/31/2016 Service – Condensing Units and Coils 24VNA9 - Refrigerant Charge Weigh-In A clip from a recent training class where Greg Sanchez details the process for weighing in the refrigerant charge on the inverter-driven 24VNA9 air conditioner. 3/31/2016 Service – Condensing Units and Coils 24VNA9 - Compressor Sump Heat Beware the "Meter Readers" and how to handle those situations when installing a 24VNA9 air conditioner with compressor sump heat. 3/31/2016 Service – Condensing Units and Coils 24VNA9 - Cooling Setup A clip from a recent training class where Greg Sanchez explains the cooling setup on the 24VNA9 air conditioner with the Infinity Touch control. 3/31/2016 Service – Condensing Units and Coils 24VNA9 - Wiring A clip from a recent training class where Greg Sanchez explains the unique wiring of the 24VNA9 inverter-driven air conditioner. 3/31/2016 Service – Condensing Units and Coils 24VNA9 - Fan Motor is Different "That's the strangest looking condenser fan motor I've ever seen!" You won't have to say that after watching this clip from Greg Sanchez at a recent training session on the 24VNA9. 3/31/2016 Service – Condensing Units and Coils 24VNA9 - Sound is Different A clip from a recent training class where Greg Sanchez explains how and why the sound from a 24VNA9 air conditioner is different than what we're used to hearing. 3/31/2016 Service – Condensing Units and Coils 24VNA9 - Inside the Unit A clip from a recent training class where Greg Sanchez takes us on a ride inside the 24VNA9 inverter-driven air conditioner. 3/30/2016 Service – Condensing Units and Coils Coil Moisture - Simple Thoughts Some simple thoughts to conclude an interesting presentation on coil moisture management that was recorded during a recent training class of Greg Sanchez. 3/30/2016 Service – Condensing Units and Coils Coil Moisture - Too Much Air A clip from a recent training class where Greg Sanchez explains the effect of too much air across a coil. 3/30/2016 Service – Condensing Units and Coils Coil Moisture - Pan Drainage The do's and dont's of evaporator coil pan drainage, as explained by Greg Sanchez in a clip from a recent training class. 2/25/2016 Service – Condensing Units and Coils Coil Moisture - Dirty Coils A clip from a recent training class where Greg Sanchez explains the effects of dirty coils on managing coil condensate. 2/25/2016 Service – Condensing Units and Coils Coil Moisture - High Pressures A clip from a recent training class where Greg Sanchez explains what can happen to coil moisture if there is excessive static pressure in the duct system. 2/25/2016 Service – Condensing Units and Coils Coil Moisture - Unbalanced Circuits A clip from a recent training class where Greg Sanchez explains the effects of coil moisture when there is an unbalanced cirduit in the evaporator coil. 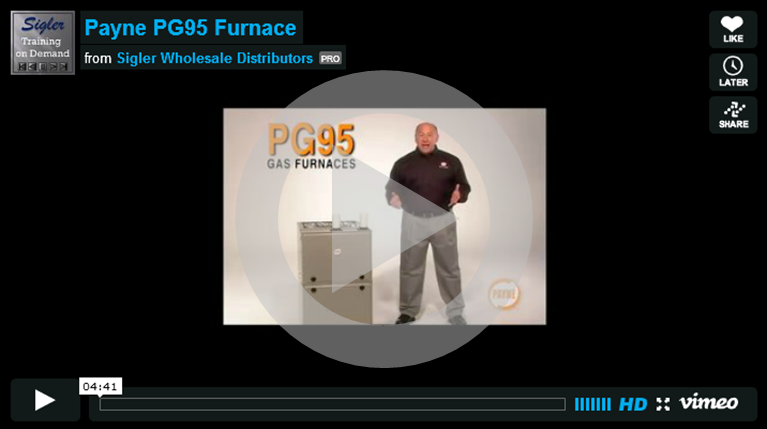 1/31/2015 Service - Furnaces New Furnaces - 58CTY & 59TP6 A clip from a recent training class where Greg Sanchez introduces two new furnace models with the new Pulse Width Modulating (PWM) motors. 1/28/2015 Service - Furnaces Secondary Heat Exchanger Cleaning A clip from a recent training class where Greg Sanchez shows why cleaning a secondary heat exchanger is important and how it can be done to minimize your frustration. 1/27/2015 Sales - Supplies and Accessories Evergreen IM Motors New to Sigler Wholesale Distributors in the Bay Area, the Evergreen IM motor is a great replacement for PSC motors in an existing furnace. This video from Genteq Motors explains more. 12/28/2015 Service - Furnaces Troubleshooting Indoor Fan Motors - ECMx A clip from a recent training class where Greg Sanchez explains how to easily troubleshoot the X-13 or Performance ECMx motor. 12/28/2015 Service - Furnaces Troubleshooting Indoor Fan Motors - PWM A clip from a recent training class where Greg Sanchez explains how to troubleshoot the newest motor in the Carrier family, the Pulse Width Modulating ECM (or PWM). 11/30/2015 Service - Furnaces 90% Venting - Considerations A clip from a recent training class where Greg Sanchez details what you should be considering before venting a 90% furnace. 11/30/2015 Service - Furnaces 90% Venting - Too Much Liquid A clip from a recent training class where Greg Sanchez deta shows what can happen with a poorly designed/installed vent pipe. 10/26/2015 Sales - Supplies and Accessories Nest Learning Thermostat Sigler Wholesale Distributors now sells the third generation of Nest Learning Thermostats. This video from Nest is a great introduction to their industry-changing product. 10/26/2015 Sales - Supplies and Accessories Nest Protect A great opportunity to sell ancillary products with Nest is the Nest Protect smoke and CO alarm. Not only does it keep your homeowners safer, but it improves the functionality of the Nest Learning Thermostat. 10/27/2015 Sales - Supplies and Accessories Pro1 T855i Thermostat Amid all the options for expensive WiFi thermostats is the feature-packed Pro1 T855i. This video from Pro1 explains the features, benefits and easy upgrade potential for all your current Pro1 customers. 9/30/2015 General History of Air Conditioning Discovery World in Europe recently aired this short documentary on Willis Carrier and the history of air conditioning. 8/31/2015 Sales - Supplies and Accessories ABM Smartphone Anemometer ABM is the creator of many smart tools, including this anemometer which allows you to accurately take airflow measurements with a smartphone. Learn how it works and some of the nice features in this short video. 8/31/2015 General An Interview with Jimmy Kimmel Okay, so we decided to have a little fun with Jimmy and here is his exclusive interview with SiglerTV. 8/31/2015 General Jimmy Kimmel Loves Willis Carrier Jimmy Kimmel, host of Jimmy Kimmel Live on ABC can't say enough nice things about Willis Carrier in his opening monologue on July 20, 2015. 7/31/2015 Service - Furnaces Setting 58CTY Airflow The new 58CTY furnace features a pulse-width-modulating motor which is not used on any other Carrier furnace. Check out this video to learn how airflow adjustments are made during the installation. 6/30/2015 Sales - Programs and Promotions CoolFront Flat Rate Pricing Flat rate pricing is often the best way for your technicians to sell a service job to a homeowner. If you use flat rate pricing today, you're probably familiar with the big book. CoolFront takes that book at moves it to your laptop for a completely electronic transaction between you and your happy homeowners. 6/30/2015 Sales - Supplies and Accessories Rx11 Flush While replacing the line set is always a good idea, this video provides you with instructions on how to use Rx11 Flush, a popular Nu-Calgon product, to clean the line set. 5/30/2015 Sales - Supplies and Accessories AirScape Installation Wholehouse fans are a great way to provide evening cooling in this marketplace. If you think wholehouse fans are noisy and inefficient, check out our inventory of AirScape. If you think they're difficult to install, check out this video! 5/27/2015 Sales - Supplies and Accessories Compressor Cross Reference Tool Ever wonder what generic compressor would work for your application? This video describes a new tool from Totaline where you can identify several compressors that will replace the one you're taking out. 4/21/2015 Sales - Supplies and Accessories Totaline Filter Drier Do you think all filter driers are created equal? Guess again! See the value of using a quality Totaline filter drier this summer. 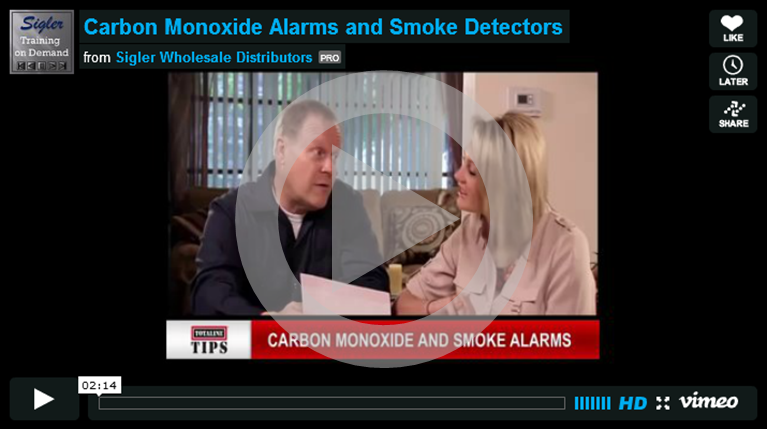 3/31/2015 Sales - Supplies and Accessories AirAdvice A video from AirAdvice about their home monitoring tool which will help you sell more indoor air quality products. 2/28/2015 Service - Controls and Accessories Cor Thermostat - Accessing Advanced Settings The new Cor thermostat has several advanced settings which are hidden from the homeowner. In this video, you'll learn how to access them and what can be modified. 1/4/2015 Sales - Programs and Promotions My Learning Center Webinar In December, 2014, several webinars were presented to the Sigler sales team. Here is one about Carrier's My Learning Center that you may find interesting. For more, go to www.SiglerCarrier.com. Log in and select "Click here for the 2015 Programs Guide." 1/4/2015 Sales - Programs and Promotions Brickyard Marketing Webinar In December, 2014, several webinars were presented to the Sigler sales team. Here is one about Brickyard Marketing that you may find interesting. For more, go to www.SiglerCarrier.com. Log in and select "Click here for the 2015 Programs Guide." 10/31/2014 Sales - Equipment Comfort Series ERV A video from Carrier Corporation about the award winning Comfort Series ERV which is revolutionizing ERV usage and installation. 9/30/2014 Service - Condensing Units and Coils A/C Leak Freeze A video from A/C Leak Freeze which briefly explains how the additive helps repair and prevent refrigerant leaks in an HVAC system. 8/29/2014 Service - Controls and Accessories Comfort Wi-Fi Thermostat A video explaining some of the unique features and setup options for the new Comfort Series Wi-Fi Thermostat. 8/18/2014 Sales - Equipment 24VNA9 Variable Speed AC A video from Carrier Corporation which introduces the VARI-efficient, VARI-small, VARI-comfortable, VARI-smart, VARI-quiet and VARI-flexible VARIable speed air conditioner. 6/30/2014 Sales - Equipment AHRI Ratings Learn about the importance of AHRI ratings and the new tool from Sigler Wholesale Distributors to simplify the process for searching ratings. 4/30/2014 Service – Controls and Accessories Infinity Touch Dealer Logo A video showing how dealers can add their company logo to a homeowner's Infinity Touch control. 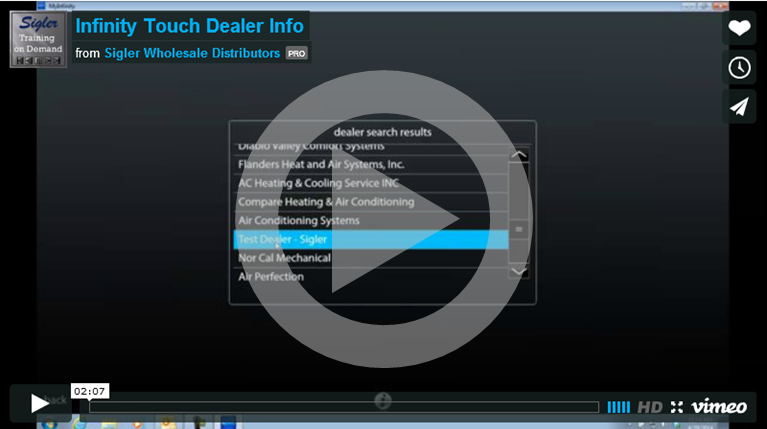 4/30/2014 Service – Controls and Accessories Infinity Touch Dealer Information A video showing how dealers can add their contact information to a homeowner's Infinity Touch control. 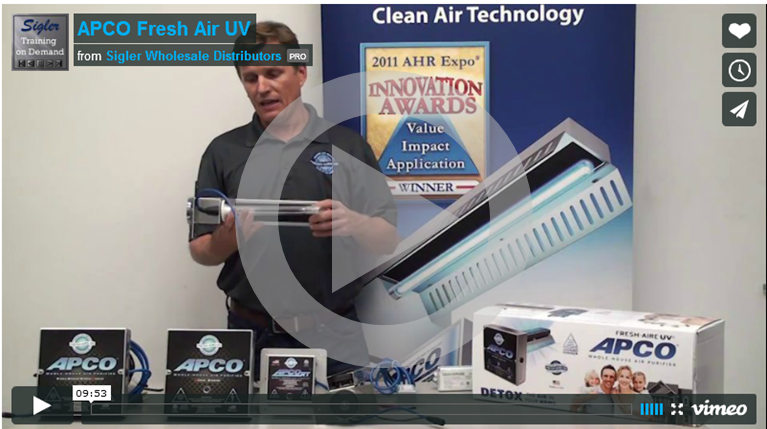 3/31/2014 Sales - Supplies and Accessories APCO Fresh Air UV A video describing the APCO Fresh Air UV family of products and an easy installation. 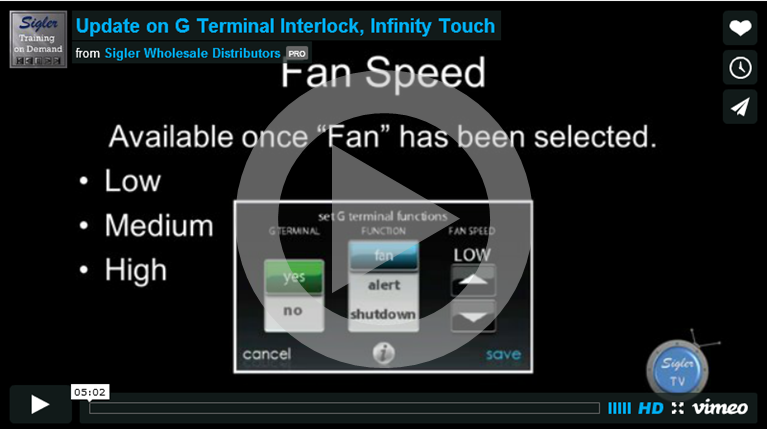 2/28/2014 Service – Furnaces Update on G Terminal Interlock, Infinity Touch Brief overview of the options available for configuring the G terminal interlock with current Infinity Touch controlled equipment. "Alert" is a new addition with v10 software and may prove useful. 1/28/2014 Moments with Russ Russ, What Keeps You Going? We conclude our series by answering the question on everyone's mind -- Russ, what keeps you going? 10/18/2013 Moments with Russ MWR-6 Even the King of Saudi Arabia needs AC More stories from Russ Sigler about a less than traditional system installation. 10/1/2013 Moments with Russ MWR-5 Oral Roberts needs AC Even the famous television evangilist needs to stay cool. Who was there to help? Our very own Russ Sigler! 9/16/13 Moments with Russ MWR-4 Three Things to Have a Successful Business Russ breaks down the three things that are required to have a successful business. 8/30/13 Moments with Russ MWR-3 Carrier Franchise Russ continues talking with Jon and Chris, this time explaining how his contracting business was converted into a distributor. 8/1/13 Moments with Russ MWR-1 There is No Money in Air Conditioning! 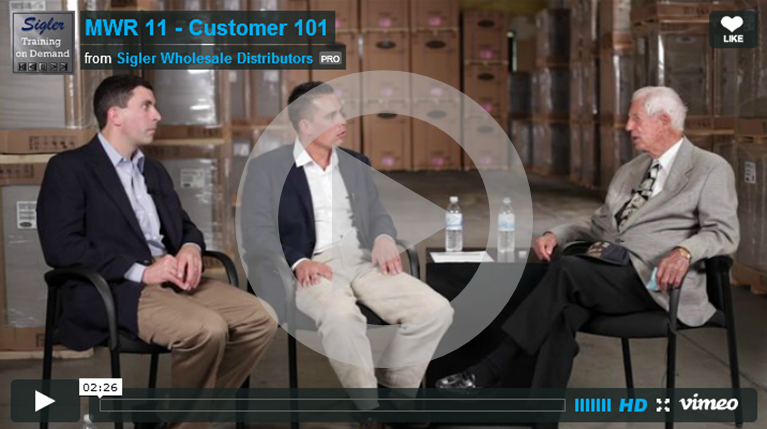 Earlier this summer, Jon Malkovich and Chris Sigler sat down with the founder of Sigler Wholesale Distributors, Russ Sigler. 6/29/13 Sales – Supplies and Accessories Selling Tips - Registers and Grilles A video that gives some helpful tips for selling grilles and registers. We don't often think of upgrade options for registers, but this video will explain how you can make that a regular part of your sales process. 6/11/13 Sales – Supplies and Accessories Nu-22B Refrigerant As the price of R-22 increases, there will be many alternates that can be used. Sigler Wholesale Distributors has sifted through the many options and believe Nu-22B from ICOR Internatoinal is the best solution. This video describes when it can and can't be used, and how to complete the change. 6/2/13 Sales – Supplies and Accessories 5-2-1 Compressor Saver An overview of the 5-2-1 Compressor Saver...not just another ordinary hard start kit. Learn why hard start components are essential and why the 5-2-1 is different from others on the market. 5/30/13 Service – Condensing Units and Coils Aluminum Coil Repair Round tube-plate fin, aluminum coil repair overview. 4/29/13 Sales – Supplies and Accessories Everclean Flex Duct Thermaflex provides a number of solutions for HVAC air distribution. Both Flex-Vent and EverClean are stocked locally by Sigler Wholesale Distributors. This video reviews the features and benefits of each, focusing on the premier product - EverClean. Either way, select Thermaflex for your flex duct needs. 4/1/13 Sales – Equipment Understanding Line Set Sizes While it's always best to use a new line set with new equipment, sometimes that's not possible. This video discusses how you can deal with smaller than usual vapor lines and smaller than usual liquid lines. It also discusses long line applications and the associated requirements. 2/25/13 Service – Furnaces IGC Code 6 A brief tutorial on the integrated gas controller, error code 6 -- hall effect sensor. This video discusses how it happens and how the error can be avoided. 1/28/13 Service – Furnaces Code 31, 2-Stage Furnaces An overview of troubleshooting Code 31- HPS did not close on 2-stage furnaces. 1/28/13 Sales – Equipment Intro to Variable Speed Motors An overview of the variable speed blower motor and where it's found in Carrier's furnace, fan coil and small packaged product families. This video includes a video produced by Genteq, the motor manufacturer. 1/28/13 Sales – Equipment Intro to X13 Motors An overview of the X13 blower motor and where it's found in Carrier's furnace, fan coil and small packaged product families. This video includes a video produced by Genteq, the motor manufacturer. 12/24/12 Sales – Programs and Promotions Product Information Tool A tutorial of the Sigler Wholesale Distributors Product Information Tool. This new iPad app was designed to help Temperature Tough Gold and Temperature Tough Dealers with in-home selling. Details about all products currently available in Northern California can be easily shown to homeowners. 11/5/12 Service – Controls and Accessories 3 Zone Kit overview A portion of the Sales Boot Camp program which focuses on Carrier's 3-zone system -- overview of the features and benefits. Originally recorded in Fall-2011. 11/5/12 Service – Controls and Accessories Residential Zoning design overview A portion of the Sales Boot Camp program which focuses on residential zoning -- proper design and the three products available from Carrier. Originally recoreded in Fall-2011. 11/5/12 Sales – Controls and IAQ Infinity and Performance Air Purifiers Help explain IAQ and the importance of purifying indoor air to your homeowners. Plus, an introduction to the new Performance Air Purifier and how it nicely complements the Infinity Air Purifier. 10/24/12 Service - Furnaces Inducer Control Board - Red Wire A brief overview of the red wire addition during the Inducer Board replacement process. 9/30/12 Sales – Controls and IAQ Infinity Touch Control -- Scheduling Part three of a three part series introducing the Infinity Touch Control. This segment is a detailed tutorial on scheduling and temporary schedule overrides. 9/24/12 Sales – Controls and IAQ Infinity Touch Control -- WiFi Setup Part two of a three part series introducing the Infinity Touch Control. This segment is a detailed tutorial on setting up the WiFi connection. 9/24/12 Sales – Controls and IAQ Infinity Touch Control -- Overview Part one of a three part series introducing the Infinity Touch Control. This segment is a basic product overview, covering the basics of programming, the basics of WiFi setup, the model numbers, product compatibilty and online tools. 9/3/12 Service – Condensing Units and Coils VC VH - Code 6 Details on the condensing unit fault code 6, VC VH. 9/3/12 Sales – Equipment Infinity Series Variable Speed Heat Pump Not used to selling a lot of heat pumps? This video will give you five simple reasons why your customers will love the new Infinity Series Variable Speed Heat Pump. 7/30/12 Service – Condensing Units and Coils Compressor Cycle Lock Out (CLO) A brief operational description of the CLO (Compressor Cycle-Loc) device with lock-out condition examples. 7/30/12 Service – Controls and Accessories Remote Room Sensors - Thermistor Sensor Averaging A look at thermistor sensors, and how they can (or can't) be arranged to provide remote room sensor averaging. 6/28/12 Sales – Equipment Friedrich Products An introduction to the Friedrich products stocked in Northern California, including Kuhl room air conditioners, Chill room air conditioners, PTAC units and portable air conditioners. 6/25/12 Service – Furnaces 2-stage Furnace Control Options Brief overview of 2-Stage Furnace operation with single and two-stage thermostat. 6/23/12 Service – Furnaces Modulating Furnace Control Options Discussion of operating sequences of the Modulating furnace when used with a single-stage or two-stage thermostat. In other words, will Nest work with my 59MN7? 6/23/12 Service – Condensing Units and Coils Control options for 2-Stage outdoor units - ACRDJ A brief discussion of control options for 2-stage outdoor units, including Adaptive Algorithm for control via single-stage stat. 4/14/12 Sales – Equipment Carrier 90% Furnaces An introduction to the Carrier 90% furnace platform. The video includes a discussion of the sales benefits, service benefits, installation benefits and an overview of the current product offering. 3/27/12 Sales – Equipment Using Accurate Utility Costs A tutorial on how to use data from pge.com to determine true $/therm and $/kWh costs which then improve the accuracy of Carrier's Online OpCost Calculator. 3/27/12 Sales – Equipment Carrier Online OpCost Calculator A tutorial of Carrier's Online OpCost Calulator -- a powerful tool to provide you and your homeowner with operating cost estimates on up to four HVAC systems.